"This has been used as a Thanksgiving favorite in my family for years. We haven't figured out yet if it's a fruit salad or a dessert! It is rich and good." In a large bowl, mix together pie filling, sweetened condensed milk, crushed pineapple, and pecans. Fold in the whipped topping. Refrigerate until chilled. A little too rich for my taste as a salad and not what I expected as a dessert. I like the "green stuff" better (the salad made with pistachio pudding and pineapple and whipped topping). This recipe is WONDERFUL!! 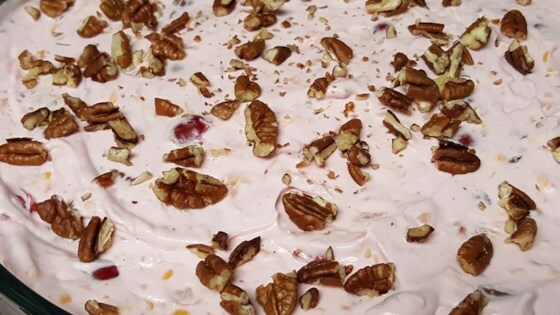 But instead of cherry pie filling, I used strawberry pie filling and pecan pieces as opposed to chopped pecans. It was a huge hit!!! LOVE IT!!! Added 2c of mini-marshmallows!